Elections 2019: Rahul Gandhi said the three key issues ruling the 2019 Lok Sabha polls are destruction of economy, corruption and the plight of farmers. Congress president Rahul Gandhi today slammed Prime Minister Narendra Modi for being the "most anti-national" and accused him of "dividing the nation". Reacting to PM Modi's allegation of the Congress turning anti-national, Rahul Gandhi said his grand old party has an exceptional track record of fighting forces that attack the nation. "Thousands of Congress workers have laid down their lives, fighting such forces. Today the most anti-national act is the act of Modi who is dividing the nation," said the Congress chief as he kicked off his day-long campaign. "Crippling the agricultural system, leading to farmers suicide is another anti-national act of (Narendra) Modi. Youths loosing their jobs is also another anti-national act. Modi has failed in all these and it's time that he answers," Rahul Gandhi said at a press conference. Rahul Gandhi said the three key issues ruling the 2019 Lok Sabha polls are destruction of economy, corruption and the plight of farmers. "We are looking forward to forming the next government," he said as he was about to leave, when a few questions were hurled at him. 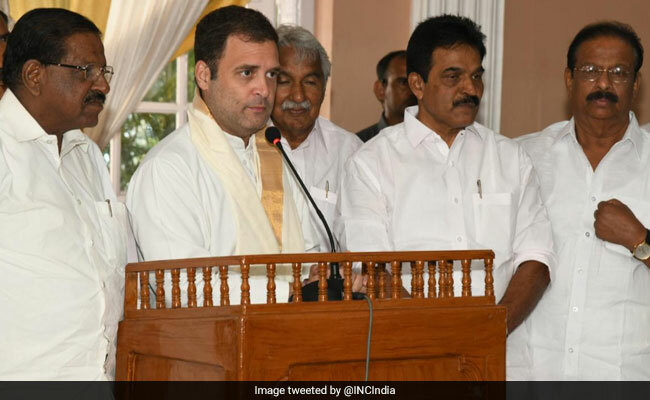 Rahul Gandhi will make a whirlwind visit to five assembly constituencies in the Wayanad Lok Sabha constituency, from where he is contesting the polls. He is also fighting from his traditional Amethi Lok Sabha seat in Uttar Pradesh.